Josh Fox is best known as the Oscar-nominated, Emmy-winning writer/director of GASLAND Parts I and II. He is internationally recognized as a spokesperson and leader on the issue of fracking and extreme energy development. In 2017 he was awarded his third Environmental Media Association award for Best Documentary for his latest film How to Let Go of the World and Love Everything Climate Can’t Change, which premiered at the Sundance Film Festival in 2016, toured the world theatrically and was released on HBO in June. In his most recent project and his first book, The Truth Has Changed, Fox tells his story of our world in crisis, turning the rapid-fire shocks that are remaking the very fabric of our lives—writing as a first responder, a reporter, a documentarian, and an activist—into art, literature, and at least one answer to the question of what the future holds. In the forward to the book, Bill McKibben notes: Josh Fox is a remarkable human being, and The Truth Has Changed is a remarkable document, bringing together his many lives: artist, truth teller, campaigner. Art is for breaking through numbness, and Josh Fox is an artist above all. That his art flows from fact, from science, from study makes it not dry and academic but immediate and desperate and necessary. Throughout 2016, Fox traveled around the US, working extensively as a surrogate for Senator Bernie Sanders and was appointed a member of the campaign’s NY Platform Committee. Working alongside Bill McKibben, Nina Turner, Ben Jealous, Susan Sarandon, Jane Kleeb and Dr. Cornel West to pass an historic climate amendment to the Democratic Platform which addressed carbon pricing, the phasing out of natural gas power plants, community involvement and adopting the Keystone XL climate standard for all federal energy projects. Fox maintains close relations with Senator Sanders as the Creative Director for Our Revolution, an organization which Sanders started at the conclusion of the 2016 Democratic primaries. Fox is a contributing journalist most recently seen in Rolling Stone, Daily Beast and online with NowThis. His reporting from Standing Rock has been seen by over 40 million people online. He is also the founder and producing artistic director of the International WOW Company, a film and theater company that he founded in 1996 that has performed across the US, Europe and Asia. Josh has written/directed/produced five feature films, six short films and over twenty-five full-length works for the stage, which have premiered in New York, Asia and around Europe. For his theatre work, Josh has received grants from the National Endowment for the Arts, five MAP Fund Grants, a Drama Desk Nomination, and an Otto Award, among others. Josh has cumulatively toured his films to over 450 cities giving speeches, lectures and question and answer sessions with his environmental film work. As an authority on the issues of contamination resulting from fossil fuel extraction, Josh has appeared on the Daily Show, Real Time with Bill Maher, The Keith Olbermann show, PBS Now, CNN, Democracy Now, MSNBC, CBS and NBC Nightly News as well as numerous other TV and radio appearances. In 2010 Josh was awarded the Lennon Ono Grant for Peace by Yoko Ono, and in 2014 received the honor of having a street named after him in the town of Aujac, France, the region where the French anti-shale-gas movement was born. GASLAND premiered at the Sundance film festival 2010, where it was awarded the 2010 Special Jury Prize for Documentary. In June of 2010 it premiered on HBO to an audience of 3 million homes, was seen by over 250,000 audience members in its 250 city grassroots tour. The film was nominated for the 2011 Academy Award for best documentary, and won a 2011 Emmy for best non-fiction director among numerous other awards. For many, this film was their introduction to the extreme energy extraction process known as hydraulic fracturing or “fracking.” Legendary actor Jane Fonda once remarked that GASLAND, “woke me up” to the impacts of fracking and the climate crisis overall. GASLAND Part II premiered on HBO July 8th, 2013 won the 2013 Environmental Media Association award for Best Documentary, the Best Film at the Wild and Scenic Film Festival and was given the Hell Yeah Prize from Cinema Eye honors. Film and Arts awards: Nominated for Best Documentary Oscar, 2011, Won Emmy for best non fiction programming, 2011 Nominated for 4 Emmy Awards including Best Doc, Writer, Research (Gasland 2) and Camera, Nominated for Best Documentary Screenplay Writer’s Guild of America, Won 2 Environmental Media Awards for Best Documentary for Gasland Parts 1 and 2, Won Cinema Eye Hell Yeah Prize for Documentary (Gasland 1 and 2) Won best graphic design 2011 Cinema Eye awards, Nominated for IDA Pare Lorentz Award, Won 2010 Sundance Film Festival Special Jury Prize, Won Big Sky Film Fest Artistic Vision Award, Won Yale Environmental Film Fest Grand Jury Prize, Won Wild and Scenic Film Festival Best Film, Won Sarasota International Film Fest Special Jury Prize, Won Traverse City Film Festival Best Environmental Documentary, Listed as Current TV 50 Best Documentaries of all time, Listed as Outside Magazine 25 most influential Docs of all time, Nominated for Drama Desk Award for Innovative Theatrical Experience, Won 2008 Otto Award for Theatre with a social mission. Awards and citations: Humanitarian and Environmental awards: 2010 John Lennon/ Yoko Ono Peace Prize, 2011 Planet Defender Award from Rock the Earth, 2011 Citizens Campaign for the Environment Equinox Award, Eco-Champion Manayunk/Philadelphia City Council, Recipient of numerous congressional, state, local and county citations and proclamations. Josh Fox’s theater group, International Wow Company, combines physical and narrative performance forms that addresses current national and global social and political crises—and creates work with potent social and political content. As the Founder and Artistic Director of International WOW Company, Fox has established himself as a significant force in New York theatre. The film and theater company works closely with actors and non-actors from diverse cultural backgrounds, including members of the US Military; activist communities in sustainable energy and design; actors, dancers, designers and filmmakers from around the world. Founded in 1996, International WOW has premiered new work in eight countries with a rotating network of over 100 actors, dancers, musicians, technical, and visual artists spanning 30 countries on five continents. With International WOW Company, Fox has received a Drama Desk Nomination, an Otto Award, five grants from the National Endowment for the Arts and five prestigious MAP Fund Grants, as well as an Asian Cultural Council Fellowship among many other awards and honors. Time Out New York has called Fox “one of downtown’s most audacious auteurs,” citing his “brilliantly resourceful mastery of stagecraft.” On stage with International WOW Company, Josh has conceived, written, directed, and/or produced over 30 productions in Thailand, Indonesia, The Philippines, Japan, Germany, France, and New York City. His recent work for the stage includes Surrender, an interactive war epic which was nominated for a 2009 Drama Desk Award and AUTO DA FE. The performance premiered in New York and toured to Japan in 2011. Other works by the company include You Belong To Me; Death of Nations; Heimwehen; The Comfort & Safety of Your Own Home, which was featured in NY Theatre Wire’s Top Ten of 2004; Limitless Joy; The Expense of Spirit; Orphan On God’s Highway; HyperReal America, which was featured in Time Out NY’s Top Ten Shows of 2001; and American Interference, voted Best in the Fringe Festival by the Village Voice. 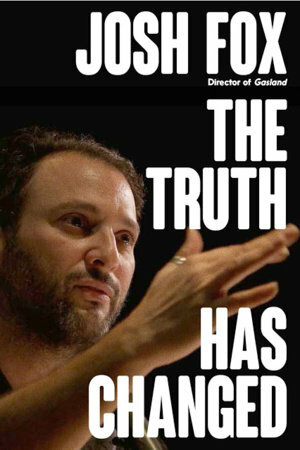 Josh Fox is best known as the Oscar-nominated, Emmy-winning writer/director of GASLAND Parts I and II. He is internationally recognized as a spokeperson and leader on the issue of fracking and extreme energy development. His film How to Let Go of the World and Love All the Things Climate Can’t Change premiered at the Sundance Film Festival in 2016, won the Environmental Advocacy Award at the Washington DC Environmental Film Festival, and was released on HBO. As the Founder and Artistic Director of International WOW Company, Fox has established himself as a significant force in New York theatre. His work for the stage includes Surrender, an interactive war epic which was nominated for a 2009 Drama Desk Award and AUTO DA FE. The performance premiered in New York and toured to Japan in 2011. In his most recent project and his first book, The Truth Has Changed, Fox tells his story of our world in crisis, turning the rapid-fire shocks that are remaking the very fabric of our lives—writing as a first responder, a reporter, a documentarian, and an activist—into art, literature, and at least one answer to the question of what the future holds. In The Truth Has Changed, Josh Fox turns the rapid-fire shocks that are remaking the very fabric of our lives—writing as a first responder, a reporter, a documentarian, and an activist—into art, literature, and at least one answer to the question of what the future holds. Our normal isn’t normal anymore. The paradigm shift that global warming represents parallels a paradigm shift in how we process truth. Both deeply affect democracy. Josh Fox has had a front row seat—a first responder after 9/11, filming the Deepwater Horizon spill close up from the air and on the ground, a member of Bernie Sanders’s delegation of the Democratic Platform Committee, risking his life to cross a bridge on Thanksgiving Day at Standing Rock, traveling the nation and the world, shooting his films, talking to people everywhere he goes. The Truth Has Changed is his first book, the companion to his new one-man show of the same title, and it’s beautiful. In How to Let Go of the World and Love All The Things Climate Can’t Change, Oscar Nominated director Josh Fox continues in his deeply personal style, investigating climate change – the greatest threat our world has ever known. Traveling to 12 countries on 6 continents, the film acknowledges that it may be too late to stop some of the worst consequences and asks, what is it that climate change can’t destroy? What is so deep within us that no calamity can take it away? In the 2010 Oscar-nominated exposé Gasland, director Josh Fox profiled hydraulic fracturing, or “fracking,” the process of injecting a pressurized mixture of water, sand and chemicals down a drilled well, causing layers of rock deep in the earth to crack and release natural gas. The film inspired a national dialogue over the multi-layered environmental dangers at risk. With Gasland 2, Fox examines the long-run impact of the controversial process, including poisonous water, earthquakes, and neurological damage, placing his focus on the people whose lives have been irreparably changed. Traveling from the Gulf of Mexico to the heart of Texas and back up to the Delaware River basin, he thoroughly investigates the effects of this once-touted energy source, as well as the industry’s equally disturbing reaction to negative claims via smear campaigns and lawsuits. Gasland 2 shows how the anti-fracking movement has done its best to amplify its message while the million-dollar conglomerates employ PSY-OPS tactics to shut it down. Unnerving interviews and shocking data underscore this scathing indictment of unregulated industry in Fox’s powerful, not-to-be-missed follow-up. The largest domestic natural gas drilling boom in history has swept across the United States. The Halliburton-developed drilling technology of “fracking” or hydraulic fracturing, has unlocked a “Saudia Arabia of natural gas” just beneath us. But is fracking safe? When filmmaker Josh Fox is asked to lease his land for drilling, he embarks on a cross-country odyssey uncovering a trail of secrets, lies, and contamination. A recently drilled nearby Pennsylvania town reports that residents are able to light their drinking water on fire. This is just one of the many absurd and astonishing revelations of a new country called Gasland. Part verite travelogue, part expose, part mystery, part bluegrass banjo meltdown, part showdown. Auto Da Fe is Masataka Matsuda’s breathtakingly poetic new work. A soldier named Odysseus A returns from war to find the emotional and physical landscape of his home utterly altered and unrecognizable. The play originally produced in Kyoto and Tokyo to much popular and critical acclaim is a dreamscape of collective amnesia, life during wartime, the self-conscious erasure of history and national identity, and a search for meaning and beauty. Written by Masatake Matsuda, directed by Josh Fox with Paul Bargetto. A simulated war deployment in three acts. Here’s what happens : When you arrive at the theater we issue you a standard military uniform: ACT 1: You train in basic combat techniques with Jason Christopher Hartley: a crash course in rifle handling, room clearing and engaging the enemy. ACT 2: You are deployed: you enter a multi-room installation to put your military training to the test. ACT 3: You fly home to experience a soldier’s reintegration into society. Conceived and directed by Josh Fox with decorated Iraq War veteran and critically acclaimed author of Just Another Soldier Jason Christopher Hartley and created by The International WOW Ensemble. • Josh Fox Interview: Sanders Pushed Party Platform to Left, But We Failed… – Democracy Now!